The report was presented to the College Board of Governors Thursday at its regular monthly meeting in West Point. Dr. Michael Chipps, president, said the latest edition of the annual report demonstrates the accomplishments of Northeast students within weeks and months of leaving the institution to become productive members of the labor force or to continue their academic journey. Eighty-five percent of the Northeast graduates who found employment following graduation obtained jobs in their field of study. The report also indicates that 85-percent of the graduates who entered the workforce remained in Nebraska, and 58-percent of those students stayed in Northeast’s 20-county service region. Terri Heggemeyer, director of career services, said the report supports Northeast’s reputation in providing an excellent educational experience. Heggemeyer and Amy Koehler, career services administrative assistant, were again commended by the Board of Governors for their success in achieving a 97-percent response rate from the approximately 900 graduates from last year. “Northeast graduates feel connected to the College and take pride in sharing their plans after their program of study, Heggemeyer said. Northeast not only contributes to the workforce through its skilled graduates and training programs, the regional economic impact is substantial to the northeast and north central regions of Nebraska. Heggemeyer said a study conducted by Economic Modeling Specialists Intl. in 2018 determined that Northeast Community College contributed $236.3 million to the regional economy through its graduates each year. The figure represents the higher earnings that students earned during the year, the increased output of the businesses that employed the students, and the multiplier effects that occurred as students and the business’ employees spent money at other businesses. 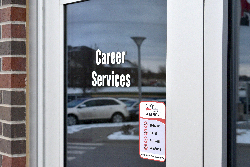 In addition to the graduate employment report, the Northeast Community College Career Services Office offers a variety of services to prepare students for today’s workforce. This includes providing one-on-one advisement and personal attention to students as they look for employment; posts jobs daily to the Northeast on-line job board; assists with writing and completing resumes´, cover letters, and applications, and offers lifetime employment assistance to alumni, among others.